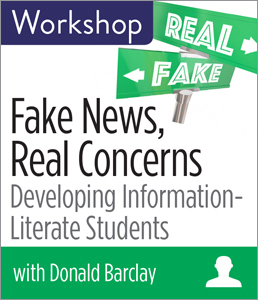 CHICAGO—ALA Publishing eLearning Solutions announces a new session of our popular workshop, Fake News, Real Concerns: Developing Information Literate Students with Donald Barclay. This workshop will last 90 minutes and take place at 2:30pm Eastern/1:30 Central/12:30 Mountain/11:30am Pacific on Wed., December 5, 2018. Recently, the phenomenon of fake news has exploded, leaving librarians and educators asking themselves how they can increase information literacy in a world that has been labeled “post truth” and where the phrase “alternative facts” has become common currency. But is fake news new? In this workshop, information literacy expert Donald Barclay uses a historical context to argue that while some of what we are seeing is new and unique to the Digital Age, much of it has been around for centuries. This workshop focuses on the challenges of developing information-literate students in an era marked by massive amounts of information, fake news, propaganda, and mistrust of authority. The workshop explores the factors contributing to today’s seeming distrust of authority in general and science in particular as well as discusses the problems with scholarly communication that contribute to that distrust. Barclay provides you with practical tools and techniques that you can use in the classroom to foster learning and develop students who are proactive, vet information for accuracy, and use technology as a resource to increase their information literacy skills. You’ll walk away with strategies and tactics to reach students in spite of all the noise and uncertainty of the current information landscape. Donald A. Barclay, Deputy University Librarian at the University of California, Merced, has been with UC Merced since 2002. His previous position was Assistant Director for Informatics at the Houston-Academy of Medicine-Texas Medical Center Library in Houston, Texas. Since he first became a professional librarian in 1990, he has been concerned with helping students become more information-literate and, especially, helping students become better prepared to evaluate information in an increasingly complex, crowded, and confusing information environment. Barclay is the author of several books and many articles on librarianship, and has spoken on the topic of information literacy at library conferences and in broadcast interviews.